The Acer Aspire One series is one of the most popular lines of netbooks. Known both for their affordability and utility, the Aspire One netbooks are common choices for the average user as well as students and professionals. 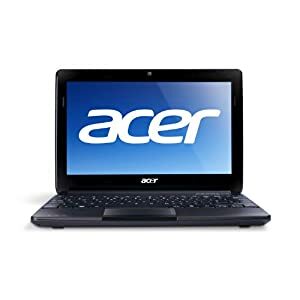 The Acer Aspire One AOD257-13685 is a 10inch netbook that is powered by a Dual core Intel Atom N570 processor. It is coupled with a 1GB DDR3 RAM — which when combined with the processor is enough to handle most of the day to day computing tasks of an average user. This netbook comes in different colors and this particular one is called Espresso Black. It has a beautiful fully black finish. It has matte black finish on the lid with the Aspire One logo printed on one side of it. The interiors sport normal plain plastic finish. The touchpad is set in to its own area on the palm rest and has a single click button made out of shiny, deep black plastic. The touchpad can take some time getting used to but it can get the job done. Plus it support multi-touch gestures, so navigating through websites, photos and document becomes that much easier. However, if you are looking for more precision and less cramping, it is better to invest in a USB mouse. The keyboard has flat, island type keys that are slightly curved individually in order to guide your fingers to the center with each keystroke. Since this is a 10inch netbook, there isn’t much space for the keys to spread out. So they are very closely set and are not meant for long typing sessions. However, even though you won’t be writing your next novel on it will still be enough to send out emails and do social networking on the move. Many of the keys have multiple functions marked in blue. They are overall comfortable to type on and each key sets in without wobbling. The netbook is not the slimmest on the market but does keep the profile around 1inch at maximum. It has its ports on the side, which include a VGA out, an RJ45 Ethernet port, two USB ports and even a card reader. The display on the Acer Aspire One AOD257-13685 is a 10.1inch LED backlit display with a native resolution of 1024 x 600 (WSVGA). Given the size of the screen, this is the perfect resolution to get things to done without having to squint every time. It comes equipped with a 250GB SATA HDD, which is enough to carry around the things that you always want have with you when you are on the move. For most people, it would fit in their entire music collection, documents and some movies too. On the connectivity front, it has WiFi-n (802.11b/g/n) but no Bluetooth. The 3-cell battery gives you a battery life of 4 hours. The Acer Aspire One AOD257-13685 scores well on buyer reviews. The only complaints seem to be about the limited Windows 7 Starter Edition. It is a good package for the low price and that is what makes it a good buy. The Acer Aspire One AOD257-13652 is a good-looking netbook that features a slim profile and updated features. It is powered by an Intel Atom Dual-core N570 processor along with a 1GB DDR3 RAM. This enables you to perform more processor intensive multi-tasking and use more sophisticated applications on your netbook. However, the slim profile and advanced processor does take its toll on the battery. Hence, if you are just looking for a small netbook that gives you better processing power and not something that has a long battery life, you can use this. This is perfect for those who have the opportunity to plug in their netbook at least once throughout the day for a full charge. This includes students, office goers and many others. You will often be able to hook up your netbook at a café. The AOD257 comes with a 10.1inch display with a native resolution of 1024 by 768, which is standard for this screen size. An onboard Intel GMA (Graphics Media Accelerator) 3150 chip handles graphics and video. This is enough to playback standard definition videos both from local sources (HDD, USB drive and multimedia cards) and online sources like Hulu, Netflix, YouTube and Vimeo. The processor is powerful enough for you to play music, surf the net and work on a presentation all the same time. However, if you use heavy graphics and lots of animation and videos in that presentation, it might slow down. It is perfect for most students and office goers alike, who just need to work on their documents and spreadsheets and gather data and images from the Internet. Its slim and light profile also comes in handy in these use case scenarios. 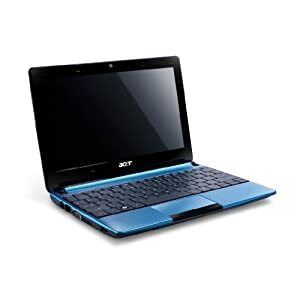 The Acer Aspire One AOD257-13652 has a full plastic body with a shimmering aquamarine finish on the lid and the upper portion of the body. The bottom is plain black plastic with heat vents firing sideways. The colored portions have a shimmering finish and the lid has an Acer Aspire One brand imprint. The bezel is of average thickness and houses the integrated 0.3MP webcam. The keyboard has chiclet style keys that occupy all the space there is, making the individual keys are bigger. The touchpad support multi-touch gestures for scrolling and zooming, which speeds up the daily workflows for most users. It is fairly responsive and comes with a single bar style click button. It has a dedicated area for scrolling on one side of the touchpad. The LED indicators are on the left palm rest edge. On the networking side, it comes with Wireless-N support along B/G compatibility (802.11b/g/n). There’s a 10/100 Ethernet port and a multi-in-on card reader as well. It has 3 USB ports (2+1), 1 VGA port (good for presentations) and the usual headphone and microphone ports. Buyer reviews show general appreciation for the keyboard, the good looks, the faster processor and the DDR3 RAM. There are some grumblings about the Windows 7 Starter Edition that comes with it but most find ways around it through third-party solutions. The lower battery life is also an issue for some. Overall, it has a very good price to performance ratio.